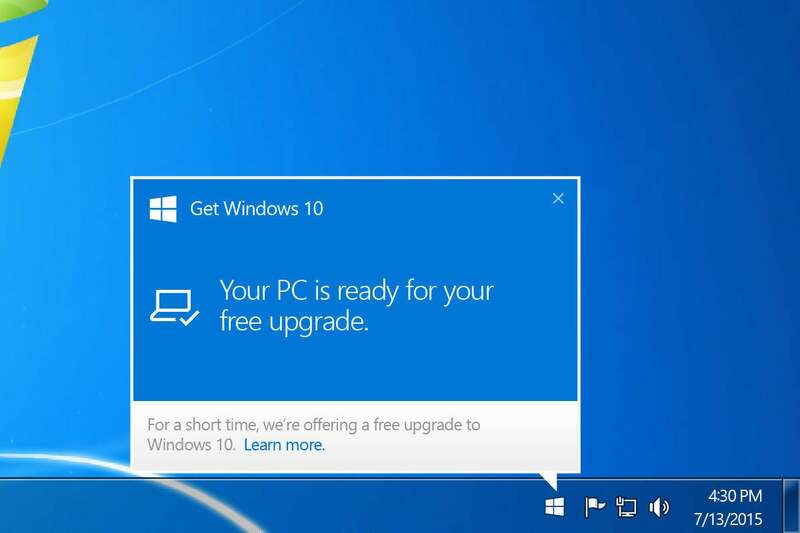 There was one issue that went unspoken in Microsoft’s announcement on Thursday that the free Windows 10 upgrade offer would end on July 29. What would the company do about all those annoying, almost malware-like, pop-up notifications to upgrade to Windows 10 that appeared on the PCs of Windows 7 and 8.1 users? The answer is they will disappear. “Details are still being finalized, but on July 29th the Get Windows 10 app...will be disabled and eventually removed from PCs worldwide,” Microsoft told WinBeta in a written statement. The company warned that it may take some time to disable the upgrade pop-ups on computers worldwide. Many people disliked the company’s approach, but it appears Microsoft’s upgrade push has been relatively successful. Microsoft said on Thursday there were now 300 million active Windows 10 devices worldwide—a bump of 30 million from late April when Microsoft said there were 270 million active users. Anyone currently on Windows 7 or 8.1 that doesn’t plan on upgrading to Windows 10 can already disable the Windows 10 prompts. The easiest way is to use GWX Control Panel, a utility that automates the process for you. The impact on you: As with all things Windows 10, conspiracy theories abound. The big question is just how serious Microsoft is about ending the upgrade strategy on July 29? If the company backtracks and decides to extend the free upgrade offer—or keep it going in perpetuity as some critics have argued they should—then the upgrade pop-ups may remain.